In this week’s review and buying guide we are looking at the best aftershave for men. If you don’t have an aftershave, then you are doing your skin a great injustice. Sure you might be getting the closest and cleanest shave with the best razor; best shaving cream/shaving soap and a shaving brush but without an aftershave your shaving experience is still incomplete. Why is this? Well, mens aftershave is like medicine for the skin. It takes care of some skin problems related to wet shaving like cuts, razor burns, and ingrown hairs. And the best part is that you can always find one that’s designed specifically for your skin type. Speaking of which, you should know that the market is flooded with aftershave products. So much so that finding the best aftershave is a tricky process. For this reason, you ought to take your time when looking for the one that will suit you best. The way you can choose the perfect one for your skin is by understanding what features make the best pick. Get to know the different types, ingredients and technology used in production. Luckily for you, I’ve done all the heavy lifting. Below is a comprehensive guide containing all you need to know to choose the best aftershave. 8 What’s the Difference Between Splash, Balm, Gel, and Lotion Aftershaves? Before we even get down to business, I feel it’s important to spell this out for you. When choosing a men’s aftershave, scent is a very small portion of the entire equation. After all, you can always buy a lowly-priced but decent cologne with a great scent. But I don’t mean that you should disregard it completely. No. Just don’t center your entire decision on it. There are other factors to consider. Aside from making you smell fresh, proper ingredients will also help soothe your skin and protect it from infections that may develop following the nicks and cuts you sustain during a shaving session. Usually, most have antiseptic properties that help them offer protection from bacteria. Additionally, they have moisturizing ingredients that help in softening and cooling the skin after experiencing the friction of shaving. The type you choose will depend on your skin type. Dry skin – if your skin is dry, and/ or you happen to live in a dry and cold area, you should choose an aftershave balm. This is especially true if this will be your first time using an after shaving product. Sensitive Skin – if you have sensitive skin, you should go with one that’s free of parabens and that doesn’t have alcohol. Alcohol tends to ‘burn’ sensitive skin. The two main ingredients to keep an eye out for are alcohol and witch hazel. This sounds like an item you’d expect to hear in a magic-based movie or TV show, right? But besides this, what is the other thing that comes to mind when you hear of it? For me, witch hazel makes me think of a natural product. And indeed it is. Aftershaves with witch-hazel are ‘natural’. Witch hazel works on the skin pores, constricting them and keeping the skin from drying up. And actually, it’s one of the main ingredients in most beauty products. Additionally, witch hazel comes with anti-inflammatory properties which help to soothe skin irritations. You can also find it in products used to treat rashes and bug bites. Last but not least, witch hazel is effective for cleaning the skin. It flushes out bacteria from the pores. Yes, even acne causing bacteria aren’t spared. Most women and men have been using alcohol to scrub their skin for a long time. But just because they’ve been using it for years doesn’t mean it’s the best product for your skin. You see, the problem with using alcohol is that it tends to aggravate already irritated skin (alcohol will sting when rubbed on the face). And more to this, alcohol causes the skin to dry up. So what does this mean? Well, it’s quite clear that witch hazel is better than alcohol. Tea tree essential oil is a natural antiseptic product. It cleans out pores in the face and prevents skin infections. A mix of witch hazel and tea tree oil is bound to have a soothing effect on a recently shaved face. You surely must have heard of aloe vera many times that you care to remember. Heck, you probably have used it or a product with it before. Aloe vera is loved for its soothing qualities. Additionally, it helps in reducing skin pain and healing skin burns and irritations. Given its reputation, you know it will work wonders on your skin. These include ingredients like lactic acid, sorbitol, and glycerol. Humectants help in reducing the dehydrating effects of other ingredients. Yes, you need a product that makes you smell good and fresh after. So while the fragrance may not be the ‘make it or break it’ feature, it’s still a consideration you should make based on your preferences. With that said, here are some fragrance factors to consider. How long the scent will last on your skin will be determined by a couple of factors including skin type and body chemistry. Most fragrances are made from oils. For this reason, when used on dry skin, they will dissipate fast. However, the fragrance will last longer when on oily skin. Additionally, alcohol also affects how long the fragrance lasts. This is because alcohol evaporates quickly. If the aftershave has a minimal fragrance (and has alcohol) the scent will dissipate even faster. The most popular fragrances you’ll come across include oriental, citrus, woody and floral. You should note that high-quality fragrances have several layers that appeal to your senses. These layers include the base, middle and top layer. The top layer of the fragrance is what will hit you when you first open the bottle. However, this fragrance doesn’t last long. The middle layer forms the bulk of any multi-layered fragrance. And finally, the base layer manifests when the top layer is depleted. It mixes with the middle layer to provide a scent that lasts long. And with that, we can now proceed to some aftershave reviews. Oh man! I’m sorry if you’ve been unfortunate to suffer from pseudo-folliculitis barbae. I know it’s not a laughing matter. To help save you from the discomfort, here is a sure remedy to your problems. Here I’m specifically referring to razor bumps or ingrown hair. Razor bumps are super uncomfortable and are the number one contributors to a lousy shaving experience. Luckily, Lab Series is here to the rescue. 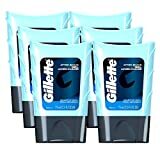 It’s true that there are numerous aftershaves that claim to help with the above-mentioned problem. However, only the Lab Series walks the talk. Ingrown hairs are caused by the curling back of freshly shaved hairs towards the skin which eventually penetrate it. They are super uncomfortable and trying to shave around them or lightly over them results in major discomfort. The 3-in-1 Lab Series Post Shave helps in relieving the pain as well as preventing the development of ingrown hairs. Here’s how it achieve this. First and foremost, the blend features plant-based ingredients which help in refining the hair of your beard. You will start noticing results in about two weeks when your hairs start feeling finer and thinner. Additionally, the gel also increases your skin’s exfoliation. The exfoliation will ultimately allow the follicles to remain open and force the hair to grow outwards instead of inwards. So far we’ve reviewed three benefits the 3-in-1 Post Shave Remedy. Here is a quick list to ensure you don’t miss any point. It promotes quality beard growth. The hairs that grow are finer and softer. Another benefit of using this 3-in-1 Post Shave Remedy is that it helps in slowing down beard growth on the areas you apply it. Now it’s understandable how men looking to grow thick beards would find this a major turn off, but all the same, it’s beneficial to a male who prefer to keep their faces bare and smooth. And last but not least, the 3-in-1 post shave features a long list of top grade ingredients. These ingredients do not include parabens. The ingredients collectively work together to help renew your skin. Note: Lab Series is not a new brand. It’s been in the industry for quite some time (30 years to be exact). During this time, it has produced several popular oil control and anti-aging products. As such, it should not come as a shock that its aftershave ranks top on my list. This post-shave is a remarkable product. It is tested in state of the art labs to ascertain that it does a good job. Believe it or not, there was once a time when men enjoyed getting their beards shaved at the local barber shop and felt that shaving days should come sooner. They were excited and enthusiastic about the entire shaving process. Back then, this Proraso aftershave was the go-to product and no one questioned its ability to deliver as marketed. It shouldn’t be a surprise that Proraso is a popular brand the world over. Here’s some quick math to show you why this is. Proraso has been in existence since 1948. Today, it is one of the leading shaving brands in Italy and certainly has become a big part of Italy’s manly shaving culture. Over the years, the aftershave has evolved, constantly improving. It doesn’t include silicone, artificial colors or parabens. Proraso’s toning and refreshing lotions are really good. In fact, they are rated as being the best aftershave lotions for men. In addition to great lotions, Proraso also makes awesome aftershave balms. If you are seriously considering going down the path of wet shaving, then you should also consider Proraso shaving cream and shaving soap – you owe it to yourself. The lotion is made from natural and fresh ingredients. The Eucalyptus oil in the lotion helps in toning and purifying the skin and softening your facial hair. The price is just right. You can get the lotion for about $14. Proraso strikes a perfect balance between quality and price – something that other brands are somewhat struggling with. With this aftershave, you will surely get value for your money. You’ll fall in love with its fast action in the process. This aftershave provides almost immediate relief. It’s also worth noting that this lotion doesn’t contain animal-based ingredients. Proraso is popular for its high-quality wet shaving products. This lotion is no exception. You will definitely love the feeling of your skin after gently massaging the lotion into your skin. If you have sensitive skin though, I recommend you pick up the Proraso Liquid Cream Aftershave version or the Jack Black below instead. Every time you stand in front of the mirror, razor in hand, your goal should always be to get the best possible shave. But unfortunately, we may not always get the best shave every time. And there are a couple of reasons that contribute to this. These reasons include weariness, using a dull blade or simply lack of attention. In such circumstance, your face will always lose against a sharp blade and the best razor in the market. You will end up with razor bumps, nicks, and cuts. Oh well! But here’s the good news. Not all hope is lost. You can salvage your shaving experience even after the nicks and cuts using this Jack Black cooling gel. This gel will put everything back on track for you. The cooling gel is alcohol-free and is soothing. It always wins against redness, razor burns, and irritations. And even better, it doesn’t sting your face as most aftershaves do. This last point is super important. After all, you do not want to add to your discomfort. This cooling gel is designed to have a cooling effect which closes the pores as it calms the burning sensation on your face. Moreover, the gel contains aloe extracts. And as mentioned before, aloe is great in healing irritated skin. The witch hazel and chamomile in the gel also contribute to soothing the skin. Other ingredients include sage and lavender oil. Sage helps to regulate blood circulation to the hair follicles. It promotes healthy hair growth. On the other hand, lavender oil helps to heal the skin. It has antiseptic properties which make this possible. Lavender oil also helps to reduce redness and pain as a result of sunburns. And last but not least, the cooling gel is fragrance and colorant free. Being a natural product, it’s perfect for persons committed to a natural lifestyle. Everyday shavers and reviewers also love the fact that they only need to apply small amounts to the face to achieve full benefits. It is almost impossible to get a product that beats this lotion especially if you have sensitive skin. It is in our opinion the best aftershave for sensitive skin. But aside from this, the product is perfect from all other skin types and the fact that it can be used as protection from sunburns is an added bonus. Its package design and scent conjure images of pirates and grizzly sailors of the wild seas. After spending many months on the sea, sailors got to land desperate for a close shave and anything that would help them smell better. The Bay Rum aftershave was the answer to their woes. It helped to tame their irritable skins and masked their “aroma”. This helped them ease into the life on land without being shunned by the community (and well, hot babes). This is why this type of aftershave has for many become a favorite of all time. Bay Rum worked wonders for them and it will do the same for you. Barberry, the company, has managed to successfully merge the present and the past into a splash aftershave which is healthy and smells really good. This is a combination that is very difficult to beat. As the best smelling and best product overall, a lot of work must have gone into its creation. The splash aftershave is handcrafted from natural ingredients and then aged for 30 days before its put on store shelves. It’s worth noting that Barberry makes use of glycerin and not alcohol. The glycerin helps to moisturizing the face without stinging or causing any other irritations that are common with alcohol-based products. Barberry Coast Bay Rum features a blend of spices, essential oils, citrus, and extracts. It also includes bay leaves essence – the kind that’s found in Islands. I repeat, the ingredients used are natural and the product is free from parabens, and GMO oils. Note: when you apply Barberry Coast Bay Rum, you’ll experience a burning sensation. The sensation passes really quickly. But before you pass judgment, no, it’s not uncomfortable. It will help to awaken and trigger your senses. You’ll not only be ready to take on the world but you’ll also smell great. Actually, some men have gone on record to state that the scent is more like catnip for ladies (they just cannot resist it). So why not give it a try? Last but not least, the Barberry Coast Ray Rum includes a 100% guarantee. In case you do not like the splash for whatever reason, you’ll be issued a full refund. This goes to show just how much faith the company has in its products. So why should you not trust such a company? Barberry coast has dedicated itself to producing quality and unique grooming products for men. For this reason, the aftershave is exemplary and almost has no rival. It has a great smell and has moisturizing effects. The product also helps to replenish the skin. Usually, most people first notice that this balm is thicker than other balms. However, its thickness usually proves to be just right. But on the flip side, its texture is slightly more buttery than that of a lotion. Additionally, it’s not sticky and greasy. This makes it a breeze to apply. But aside from its viscosity, this balm has a host of other good features going on. These features give it an edge over competitor balms on the market. At the very top of the feature list is the fact that it’s perfect for sensitive skin. As a man with sensitive skin, it’s important that you get a product that will not irritate or burn your face. In light of this, you’ll be pleased to note that this aftershave doesn’t contain alcohol. Instead, it’s loaded with coconut oil which has antifungal and antibacterial properties. The coconut oil also works to moisturize the skin. Additionally, jojoba oil in the balm works to control the natural skin oil production. The balm also features vitamin E which not only has antioxidant properties but also anti-aging and antiseptic properties. Other ingredients added to the balm include neem seed oil, witch hazel and rosemary leaf extracts. Most users love that this balm naturally cools the skin without causing it to dry or leaving some unsightly oily residue behind. 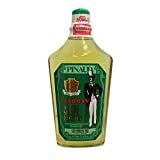 Usually, when an aftershave causes the skin to dry up, it’s because it contains alcohol. And since this balm doesn’t, you should expect impressive results. Some men describe this balm as unscented while others (possibly those with an even stronger sense of smell) pick out a mild sandalwood scent. Though the balm comes in a small package, it goes a long way. Some users state that it can serve you up to 8 months. 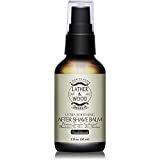 This balm from Lather & Wood is unlike other balms on the market. It is different – in a good way. You’ll undoubtedly fall in love with the non-oil feel and texture. And the fact that it doesn’t include alcohol makes it a perfect aftershave balm. It’s perfect for men with sensitive skin. Generally, Nivea is a fairly new product in the U.S. However, Nivea lotions have been in use in Germany for more than a century. Nivea offers a whopping 1600 products including Iconic Nivea Crème and it is this balm which is proving to be a mega hit in the U.S. market. 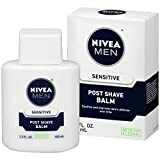 Though Nivea has a post-shave product for men with sensitive skin, most men have found this replenishing balm to be just as good on sensitive skin. The only difference is that the latter has a little more alcohol which leaves a burning sensation after its application. But despite this, it is still a great aftershave. Nivea Original has a non-greasy and mild formula which includes Provitamin B and Vitamin E. These ingredients help in regenerating and replacing the skin. In addition to this, the balm also features some special moisturizers which moisturize the skin. After applying this balm, your skin will be replenished and will feel and look new. Note: the balm is absorbed quickly into the skin. And while this balm is not marketed specifically to men with sensitive skins, it does help to protect their skins against irritation. With that said, note that it’s slightly stronger in comparison to the sensitive version. The only drawback experienced with this balm is a strong scent. Some critics say that the scent is too strong for them. It’s true that this aftershave uses alcohol instead of witch hazel. However, it’s still a great product. It’s effective for soothing the skin after a close shave. Some users also say that this Original version is better on sensitive skin than the ‘Sensitive Skin’ version. Here’s the thing, most men think applying aftershave is a straightforward process. Well, it is, but like many other things in life, there is more to it than you think. This is not to mean that it is rocket science to learn how to do it the right way. However, it does mean that there’s a right and wrong way to do it. To help you reap full benefits, below are some of the steps to follow. Immediately after shaving your beard, pat the shaved area with some cold water. This will help to close the skin pores. Use a dry towel to dry the skin. Be gentle while at it. Add some small amount of your aftershave on your palm and rub your hands for an even spread. Allow the aftershave some time to soak into the skin. This may take several minutes. Also, you might need to apply a second coat just to make sure you got all the areas. If you use moisturizer on your face, apply it after the shave but just before you use the aftershave. You can also apply witch hazel to get rid of any residue that may have been left behind after the shave. Note that this step is not mandatory since most aftershaves have witch hazel. What’s the Difference Between Splash, Balm, Gel, and Lotion Aftershaves? By now you are aware that aftershaves come in different forms. Each type is perfect for a specific skin type. Below is some more detail of which type is best for some skin types. This is a hydrating lotion that has a mid-scent (though some don’t have a scent at all). Most balms are alcohol-free and are effective in reducing the effects of razor burns. Upon application, they have a slight tingly sensation. But regardless of this, they help in tightening the skin pores. Balms are perfect for men that suffer from dry skin. They are super lubricating and stay close to the skin’s surface. They are heavier and thicker than most aftershaves. These aftershaves are mostly antiseptic. This also means that they are alcohol based. They will dry out the skin. They are perfect for beginners who haven’t mastered the art of shaving yet. They help in avoiding infections. If your skin is dry, it’s in your best interest to choose witch hazel products instead of alcohol. But if you have oily skin, then you are good to use a splash aftershave. Like splash, lotions feature strong scents in comparison to other types. The scent may be strong enough to use in place of cologne. They work to tighten and tone the skin. This type is perfect for oily skin. There isn’t a big difference between gels and lotions. Only that gels are perfect for cooling the skin and reducing the effects of post-shave burning. The skin readily absorbs gels. This makes them perfect for humid climates or the times you know you’ll sweat soon after you are done with shaving. But given how they are quickly absorbed into the skin, they rarely have moisturizing effects on the skin. When choosing these aftershaves, I considered several factors including the ingredients and how the product feels on the skin. You probably noticed that I touched these two factors on every review. I also took into account the product’s effectiveness. I did a lot of research and read through lots of consumer reviews for the brands that I couldn’t get my hands on. And with that, this best aftershave review and buying guide comes to an end. As always feel free to comment and share thoughts on the reviews and your experiences that will help others make a better choice.